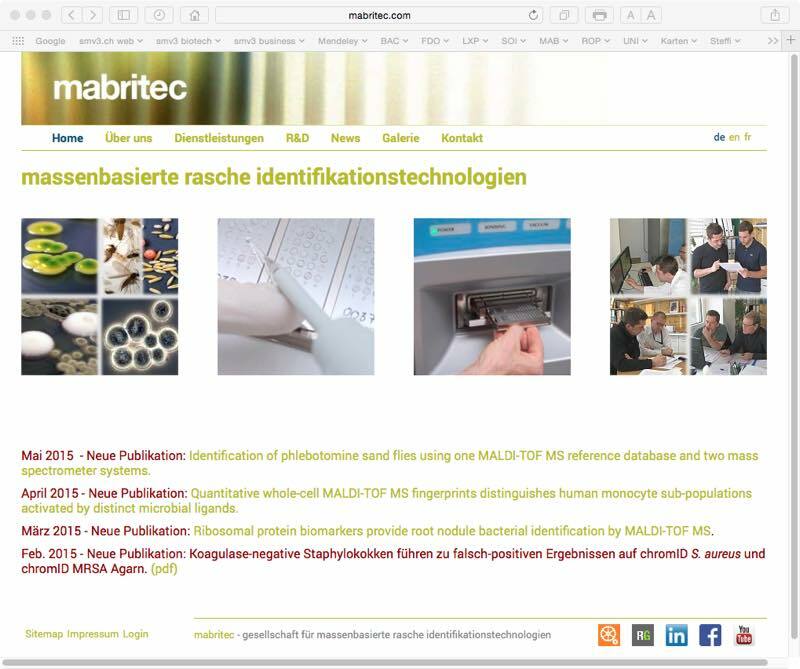 Currently I am working on a new webpage for mabritec AG in Riehen. It should be mobile compatible and easier to maintain than the current site. The current site shows the processing steps in pictures and a news section. 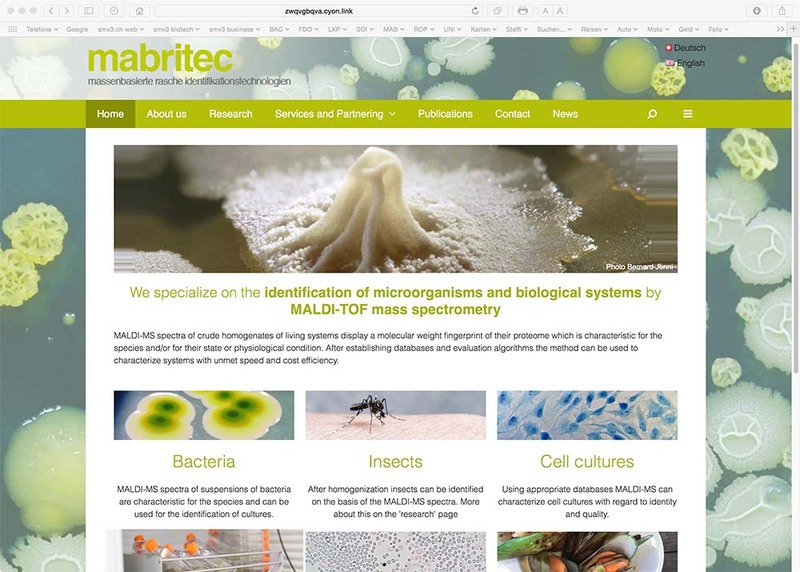 In the meantime the portfolio has evolved a lot and been enlarged from bacterial identification to many additional and innovative applications. The new page should emphasize this. 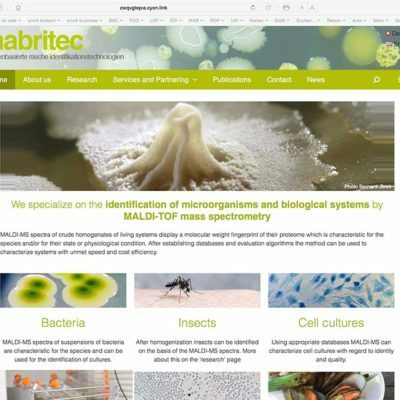 mabritec AG is specialized on the application of MALDI-MS for the identification of biological systems (bacteria, cells, insects etc). The method requires minimal sample processing and is incredibly fast and cost effective and versatile. Mabritec has improved the database query algorithms and added thousands of spectra to their proprietary library. Several partnering options are available. The current site is not mobile compatible and cannot be updated any more. Both issues should be resolved using a CMS, and the site should contain a literature database with mabritec’s publication list. It should not be overly fancy but outline the activities and qualities of mabritec: The new application fields and the innovative partnering models. The site was designed using WordPress, the ‘Generate Press‘ theme and the ‘Elementor‘ plugin. This theme allows extensive customization and the plugin flexible page layouts. The literature database is cloud based, synchronized with a full featured desktop version (Word integration, pdf attachments). To comply with copyright regulation, only the bibliographic information is published on the web site. The publications to be listed on the website are the ones in a specific folder – any changes made in the desktop or web versions are automatically updated in the website. The draft homepage features an easily customizable slider in front of a bacterial culture background. The coloring is tilted towards mabritec’s lime green corporate color. The lower section shows the most important applications and links to the respective pages. The page is still under development! The draft version will now be adjusted to the customer’s like, some content and more pictures added.